The one thing we were created for. Living a life in peace and balance. Wife to The Engineer, momma to the T-Squad and blogger, Nichole brings a fresh, raw book of authentic stories, honesty, and love for the woman who has a deep void in her soul. 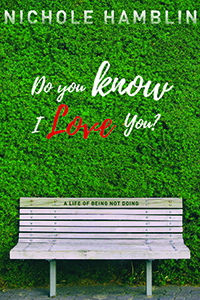 Written in Nichole’s conversational style, Do You Know I Love You is more than a question. Drawing from her significant step-by-step journey Nichole invites you to learn the one thing that finally filled the deep void in her soul. Who knows, you might just end up finding it too! Nichole Hamblin is wife to The Engineer, momma to two boys, a blogger, and speaker. An American child of the 70s, her faithful readers like her relatable, conversational and honest writing style. She is a work-in-progress who is passionate about shoes, good food, Chai tea, her family, running, reading, and taking naps. She has learned that Jesus’ love is everything. As a recovering ‘perfectionist control addict’ she is consumed with learning to lead others on the pursuit of love. Nichole can be found enjoying her team around their dining table, where stories from the day, laughter, encouragement and life lessons are shared often. Her goals are to keep her growing boys fed, spread love and continue to explore the beautiful island New Zealand where Team Hamblin is currently residing.